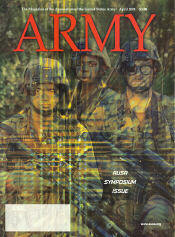 Description: Magazine of the Association of the US Army. A monthly four-color magazine focusing on the activities and interests of the U.S. Army worldwide, ARMY serves a readership interested in issues of national security; past and present issues involving landpower; and future trends in the military arts and sciences. The magazine focuses on developing and presenting thought-provoking articles and analyses for a professionally oriented audience.